Are you ready for a freezing and a rewarding experience, you better be, this is because this is exactly what this Microgaming video slot has in store for you. It will take players into the north pole where they can accompany a group of Viking warriors, as they search for the great fortunes of the Arctic. The Northern freezing theme of the slot is apparent from the beginning as players will see Viking warriors, a dire wolf, Viking helm, Viking shields, a treasure chest and a female Viking warrior among other symbols. 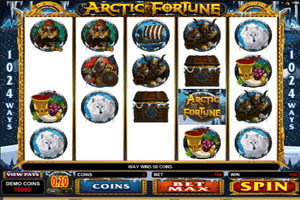 Play Arctic Fortune Slot here. The game has 5 reels and it offers online players the high paying format of 1024 ways to win, which is much better than the paylines format. Apart from the 1024 ways to win, players will find that there are plenty of other special features and bonus round in store for them. For example, there is the logo of the game icon which acts as wild card that will aid players in forming winning combos on the ways to win of the slot. Besides this wild icon, there is also the treasure chest symbol, 3 of these symbols will trigger the bonus round in which players can earn plenty of free spins, multipliers and coins.